Discussion in 'Hardware' started by thatcomicsguy, Mar 14, 2017. Steve S and sonichedgehog360 like this. In a time when everybody with an interest in digital arts is investing in tablet technology, with pen computing on the rise, it seems somewhat tragic that Wacom should find themselves in a loss position. I don't want to say, "I told you so", -and despite my grievances with Wacom's pricing and product design directions, I think we can all agree that without that little Japanese tech company and their brilliant contribution to the field, this forum wouldn't even exist and we'd all still be pushing pencils. But I sort of feel like we all saw this coming. What choice, realistically, did kids and broke artists really have when faced with the "Save thousands of dollars by seeking alternatives" option? There's clearly a high-end market out there, -witness the Surface Studio as one example. But Wacom didn't seem to be able to provide an affordable alternative to their premium studio models. I would have been much happier had MS not felt compelled to pull out of the licensing market. I'm still not entirely sure why they went that route. And with N-Trig and their fault-ridden tech! -When the Wacom EMR patents were becoming universally available. A double whammie. The sad thing is that Wacom still provides the best digital drawing experience on the planet. I hope they can get their ship in order. siddhartth, rebelismo, DRTigerlilly and 2 others like this. Also, aren't Wacom's EMR related patents about to run out? Thus, they'd be facing competition from Chinese clone makers. Seems like they are taking measures to get a younger management team. Might be their smartest move. Digital artist found dead in home. Details sketchy. WillAdams and sonichedgehog360 like this. Several of their key patents ran out a few years back. That's where Yiynova and Bosto Kingtee came from, among others. Kumabjorn and sonichedgehog360 like this. You can have the very best product in the entire world but if you cannot convince your average, everyday person that it is the best thing since sliced bread, they will settle for whatever the leading brands are pushing them. There are companies on the market like Apple with the Pencil and Microsoft with the Surface Pen which each offer a compelling product which to the average consumer probably feels very similar and more than good enough. I think Wacom bolstering a blossoming relationship with Microsoft and the rest of the OEMs who make up team Wintel along with Samsung is a wise move they already have taken to make their product a household name. People are looking to save thousands of dollars by buying cheaping tablets with Wacom pen technology inside. But Wacom still has the opportunity to make millions by charging licensing fees for the technology inside. Is it true that EMR is now becoming universally available in the public domain as patents expire? If so, to what extent are the details of the technology available to Wacom's competitors? Wacom may have preliminary patents coming up for expiration. But besides this early technology, what about the decades of refinement and innovation that still remain undisclosed and proprietary? Wacom can still license out the countless improvements they have developed and incorporated over the years. The war of pen technology for the granddaddy of them all is not over yet, I think. Aman and WillAdams like this. The initial EMR pen/digitizer patent expired in the 2000s and we got competitors with battery-free EMR pens. The enhanced EMR pen/digitizer patents expired a couple of years ago but we still haven't seen competitors with battery-free tilt EMR pens with enhanced precision. This patent represents the digitizer and pen of the professional-grade Intuos and Cintiq lines, accurate to ±0.25mm according to Wacom. Their newest pen/digitizer with "8192 levels of pressure" isn't noticeably better than their old '90s Intuos/Cintiq pen/digitizer with 1024/2048 levels of pressure, and despite claiming it's "4 times more accurate" they haven't released an exact number, and they might only be talking about edge accuracy which they finally fixed. If a company is willing to put in a little R&D they can compete toe-to-toe with Wacom when it comes to accuracy, precision, response time, and everything else. Steve S, sonichedgehog360, WillAdams and 1 other person like this. Wacom diluted their brand and made their product naming scheme worse than meaningless. Every time they rebrand "Bamboo" or "Intuos" they make it harder to determine what the true pro-level product line is. I'd hate to think that this was by design, but it does make me wonder... They haven't done much in terms of innovation or improvement of build quality. What I find unacceptable is that their Cintiq line has NEVER BEEN COLOR TRUE. The only reason they were able to get away with this before was because of their near-monopoly in the market space. Well, that's going to be over soon. They had a 20+ year headstart against their competition and rested on their laurels instead of doing incremental improvements to the underlying product designs. Nowadays, I hear more and more young artists getting into digital drawing with Monoprice and Yiynova tablets. Wacom's entry-level product isn't worth the elevated price compared to the Chinese competition, and the pro-level tier is stagnant enough that it is ripe for disruption (from Microsoft et al). Burgundy, Aman, thatcomicsguy and 4 others like this. Not sure if it would have helped, but they could have demanded of every licensee that they add 'Wacom inside' or something similar to the promo material of any device that uses Wacom. I suspect they didn't do that because they wanted 'pure Wacom' devices to stand out, but it certainly would have helped consumer awareness. What I find unacceptable is that their Cintiq line has NEVER BEEN COLOR TRUE. Nor sure I get what you mean with this, but for what it's worth the Cintiq Companion and Cintiq 27 have the best displays I've seen on a tablet so far. they could have demanded of every licensee that they add 'Wacom inside' or something similar to the promo material of any device that uses Wacom. I suspect they didn't do that because they wanted 'pure Wacom' devices to stand out, but it certainly would have helped consumer awareness. The 27QHD supports 97% Adobe RGB and 10bpc color. The Mobile Studio Pro supports 94% Adobe RGB, the Companion supports 75% of the Adobe RGB gamut, neither have 10bpc color. Professional image work usually demands a wide color gamut (Adobe RGB or DCI-P3), accurate colors (delta-E of 3 or less, preferably 1), and preferably 10bpc color (otherwise the difference between each individual hue on a wide color gamut is pretty big). The 27QHD came out in 2015. Until then, there was no Wacom tablet that properly supports a wide color gamut and accurate color work. This is a huge oversight on Wacom's part. It goes together with the edge drift and the air gap as problems that could have easily been fixed should they have chose to fix them. In 2016, they finally fixed them with the Mobile Studio Pro 16 (but forgot about 10bpc color). They've been sitting on their asses from 1990 to 2016, blowing their huge lead because they simply didn't have any competition. The above shows their dominance in pen tablets. It's safe to say their dominance in pen displays is above 90%. By the way, the components they sell to Samsung is a huge part of their income. 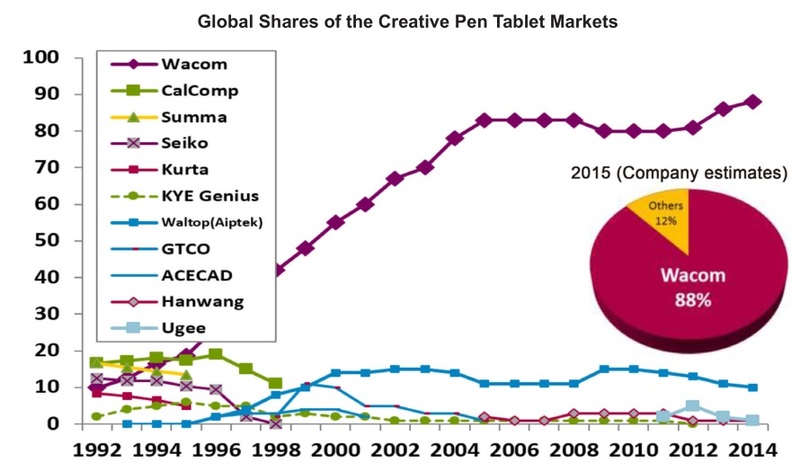 It's staggering that they're actually losing money when they have this huge client and this dominance in the pen display and pen tablet markets. thatcomicsguy and rebelismo like this.